While doing these, I recognized who the dog shades are. First is Kyoushiro, second GB, third Tesshin, fourth Rocket and fith Jerome. May I post this stamp on my profile as my faveorite stamp? I will give you all the credit! Promise! Ok! Thanks! I'll be absolutely sure to give you credit! Can I use it on my profile? Yup, it is. I guess you can find it on YT, but only in japanese with english subs. Duh duh duh duh daa...YAH! If it was in English I would be in love with it..
All because of this stamp;I have fallen in love with this show! Oh wow! I'm pleased to hear that. 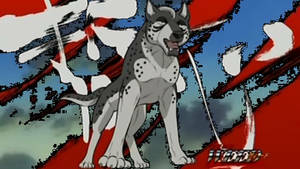 Have you watched Ginga Nagareboshi Gin too? It plays 14 years before GDW and is, to my opinion, the better show. I love this part in the intro. I love this anime, and you made a cool stamp, and I never noticed who the jumping dogs were Can I use this stamp in my collection please ?